It’s a minor detail, but if you watch The Sound of Music closely enough, you’ll notice that Captain Von Trapp (Christopher Plummer) keeps a whistle on him practically all the time. The whistle’s most striking use comes, of course, with the children’s thrilling entrance, the thunderous footsteps scrambling on the balcony, and then their march downstairs synchronized to their father’s command. But even when he’s returned from a sojourn in Vienna, presumably relaxed from a convertible mountain drive, he doesn’t waste a moment in reaching into his pocket to pull out his trusty boatswain’s whistle, shrilly reminding his children that tree-climbing and canoe-tipping are seriously prohibited. Of course, once the Captain hears and joins in the serene harmonies of his children singing the Alpine ode, “The Sound of Music,” the whistle no longer appears, replaced, it seems, by his own surprisingly soft and tender voice. It’s easy to see why whistles play a secondary role in a film that celebrates singing; as metallic, militaristic instruments they emphasize conformity against the earthy and implicitly national independence taught by the headstrong Maria. 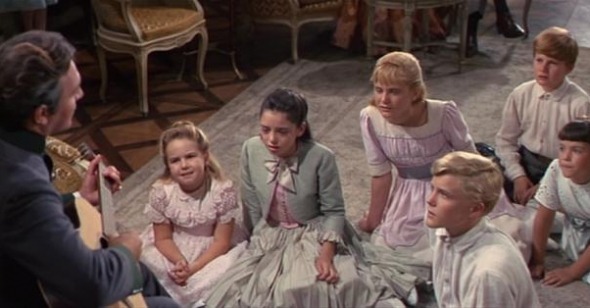 Unlike the mouth-whistling from another Rodgers and Hammerstein musical, The King and I, in which protagonist Anna eases her son’s anxiety as their British boat approaches the kingdom of Siam with “I Whistle a Happy Tune,” Captain Von Trapp’s whistle is distinctly un-musical. A far cry from other famous movie whistles, like the tell-tale duet of The Man Who Knew Too Much, the murderer’s calling card in M, or Snow White’s work song, the Captain’s whistle is more a tool than an instrument, a sound produced by industrial means, not the soulfulness of the human voice. But for the Captain, the whistle is also a token from his past as a decorated Austrian U-boat commander, a necessary device for communicating to crew members beyond the reach of an ordinary voice. The whistle is a sound that carries. Its piercing endurance is all the more poignant for the fact that, following the newly landlocked Austrian border in the wake of WWI, the Captain was left without an ocean—without a navy, without a ship, and also, without a wife. The whistle is in some real sense all that’s left of his former life, that and his brood of children dressed in identical sailor suits. For me, this is the key line of the scene, and possibly the entire film. More than its militaristic, fascistic uses, the whistle is about listening and attention. It sounds a call that brings together family and nation, a bright note to call all Austrians back to some sense of home, no matter how far they’ve traveled, or how much their own country has changed. When, at the music festival, the Captain leads the auditorium in a patriotic rendition of the folksy “Edelweiss,” the “homeland” he sings about is anything but certain. With the Anschluss already underway, and Austria headed into another war, the Von Trapps are forced to leave, to find their homeland elsewhere. Herr Zeller (Ben Wright), whom the Captain previously accused of being the Nazis’ “entire trumpet section” (predictably, musical metaphors abound in this film), agrees to allow the festival to continue as a sign that “[n]othing in Austria has changed. Singing and music will show this to the world.” While Max Detweiler (Richard Haydn), the opportunistic (and Jewish and presumably gay) “uncle” that looks after the children, pleads for the Captain to allow his family to sing in the festival, he strongly resists, well aware of how easily music can be twisted for propagandistic purposes. Yet cornered onstage, he finds a different kind of opportunity, not only to escape but also to regain the country that was lost to him so long ago. Where the whistle previously brought together his crew and his family, now it is the Captain’s own voice that takes on this gathering function. In The Sound of Music, what the whistle or any instrument does is ultimately more important than its sound. Music must have meaning, as Maria teaches the children in “Do-Re-Mi,” and on this evening concert stage, the songs the family sings seem critically important to the fate of the entire nation. The Captain chooses “Edelweiss,” which, to the chagrin of many Austrians, is a faux national anthem written by Rodgers and Hammerstein, too often mistaken as real. It’s also a song for a country that doesn’t exist, or a country that can only exist in song. “Clean and bright,” it’s music for a corrupted nation, or corrupt music, as Pauline Kael would have had it, having described the film as “a sugarcoated lie that people seem to want to eat” in her famously scathing review. Yet the song’s overt earnestness also underlines that the film might be in on that lie, especially as the “peaceful” arrival of the Nazis was possible only because of Austrian complicity. There are, after all, no Germans depicted in the film, only Austrian collaborators like Rolfe and Zeller, or those like Uncle Max who merely stand by and let it happen, waving a wan Sieg Heil as the Anschluss bulldozes through the cobblestone streets of Salzburg. The lone dissenting Von Trapps, of course, are ultimately headed for America, singing a patriotic Austrian tune written by Rodgers and Hammerstein explicitly in the key of Tin Pan Alley. The whistle that the Captain carries from his naval past might have disappeared, but its function does not. Where the whistle had been loud and clear, his voice falters in the second verse of “Edelweiss,” from stage fright perhaps, or from the enormity of the task he’s trying to accomplish. How can one voice be heard? He’s quickly joined by Maria, his children, and finally, the Austrians in the audience stirred to singing, and possibly more. In a movie filled with all kinds of music, from the hymnals of nuns, the goatherd yodels Maria teaches to the children, the sounds of brooks and larks, and the dull bell tolling the arrival of the Anschluss, it’s the Captain’s “Edelweiss” that demands most urgently to be heard. It’s not the loudest sound, but it’s the one that travels most widely, a signal that calls out to all, a flash of recognition in a deeper kind of music.